The hostel is part of a larger plan to revitalize MacArthur Park. A board headed up by Downtown Partnership director Sharon Priest has raised $100,000 to hire a consultant to work with park neighbors on improvements, and is planning a 5K race next May on what's being touted as the history trail linking the River Market district and the park nine blocks south. Fordyce hopes the Firehouse Hostel and Museum will be open by then. In the past three years, the board has raised $100,000 — what Fordyce calls an “awesome” amount — for the project and needs $300,000 more to complete the first phase of remodeling that will allow for 30 beds (and a family suite) and several bathrooms. Some of the funds have come from the annual Five Alarm Frenzy at MacArthur Park, which features cake walks, firetruck rides, music and food. The first floor of the hostel will contain artifacts from the Little Rock Fire Department, which has been an enthusiastic supporter of the idea. Two antique firetrucks will go into an annex to be built in the future, next to a glassed-in dining room facing the lake. The city of Little Rock signed a 50-year lease with the group that allows it to occupy the building rent free. The Fordyces became hostelling fans during a trip to Europe in 1997. In exchange for privacy and room service, hostels provide inexpensive shelter ($20 a night on average) — and great fun, Linda Fordyce said. A day trip turned into a week-long stay when they visited their first hostel in Switzerland. “We loved the way people cooked, played cards, talked,” she said — and exchanged cultural and travel information. Since then, the Fordyces have stayed in more than 50 hostels, both in Europe and all over the United States, from Washington, D.C., to Hawaii. Fordyce has done her homework on what it takes to keep a hostel open: The average hosteller is between 18 and 28, college educated and interested in the history and culture of the places they visit. Keeping the hostel running will require at least 45 percent occupancy. She's convinced the Firehouse would have no problem operating at that rate; bed and breakfasts and the Little Rock Convention Bureau have told her that inquiries for hostel accommodations come in weekly, and the Firehouse gets calls to the number already listed in the phone book. She said the hostel will also appeal to school groups or kids' sports teams looking for inexpensive lodging and a self-service kitchen that will help save on meals. She mused about the best meal she ever had at a hostel: Fresh halibut steaks in Juneau, Alaska. 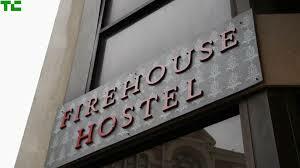 The Firehouse Hostel should have a website up and running soon. For more information, go towww.firehousehostel.org.